Join Team Sutton Grace and help add tomorrows! As you already know, there are approximately 30,000 Americans living with cystic fibrosis. They are moms, dads, sisters, brothers, daughters, sons, friends and co-workers who struggle every day just to breathe. We not only walk for Sutton, but for all of those with CF and hope that you will support our efforts again this year. just over 6 years, you've helped us raise over $280,000 to find a cure and we aren't done yet! Real progress has been made in the search for a cure, but the lives of people with CF are still cut far too short. There still is no cure for this devastating disease. By walking today, we are helping add tomorrows to the lives of people living with cystic fibrosis. Will you please join us? Support us by joining our team and/or making a donation to our Great Strides fundraising campaign today! 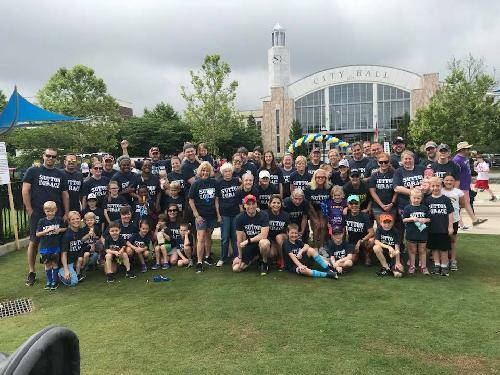 Great Strides Atlanta will be on Saturday,May 18th at the Suwanee Town Green! It's a fun, family-friendly 5k event that raises awareness and support for people with CF and their families. Please support Team Sutton Grace to help us get one day closer to a cure! Your gift will help add tomorrows fopr Sutton and all of those with cystic fibrosis by supporting life-saving research and medical progress. Your gift is 100-percent tax deductible.